The photography for this story was supported, in part, by a grant from Human Rights Watch. According to my caretakers at the orphanage, Chunchun arrived a few years before I did, when she was a baby. They estimate that I was around three or four years old at the time of my arrival, howling and screaming at the top of my lungs. I had been abandoned by my biological parents a few days earlier, and spent the intervening days on the streets. During the eight or nine years I lived at the orphanage in Chenzhou, in southern Hunan province, Chunchun was always there sitting on her urine pot. The urine pot was a round, flower-patterned enamel can, and she sat on it because it was difficult for her to use the restrooms. Chunchun was never diagnosed, but I believe from our similar symptoms that my friend suffered from post-polio complications, including scoliosis, like me. Probably, I had been abandoned because I was crippled. My memories of the days I spent on the streets are hazy. I remember it was sunny and warm most of the time. But one evening it rained heavily. A stranger helped me to a covered area that shielded me from the rain. By late nightfall, I had a stack of food beside me, donated by passersby. In the pile was a can of delicious oranges. I can still taste them. After a while, another stranger, a man who drove a black car, took me to the Chenzhou Welfare Center orphanage. 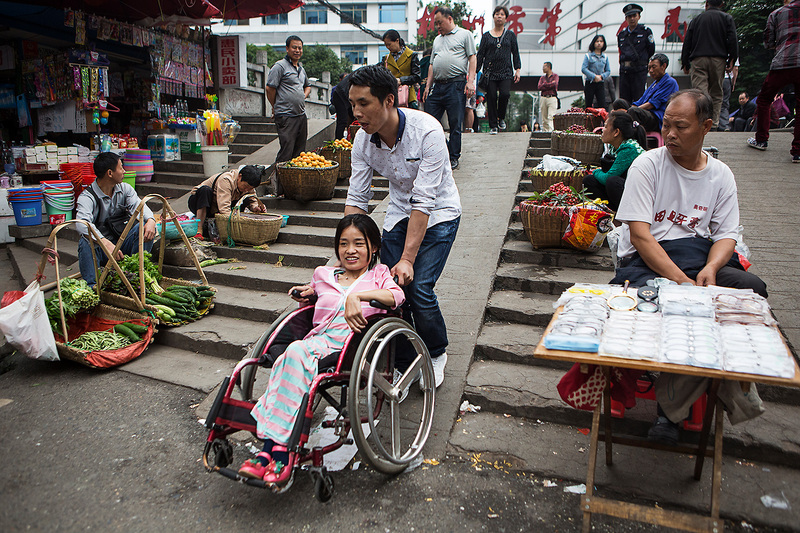 Chen Chunchun’s boyfriend, Lei Yu, who is blind, helps her down a cement ramp in Chenzhou, Hunan province. 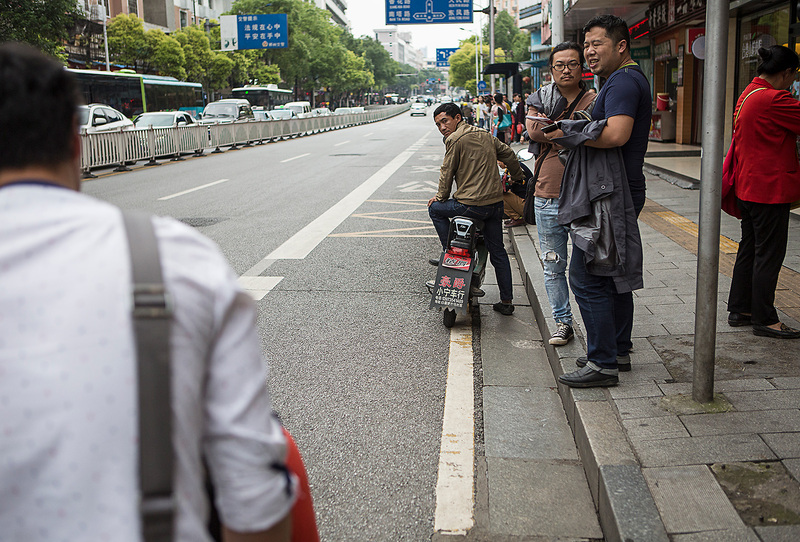 For the most part, public spaces in China are not wheelchair accessible; this is especially true in smaller cities and towns. Ming makes her way down a crowded London street, where she was studying for a Master’s degree. 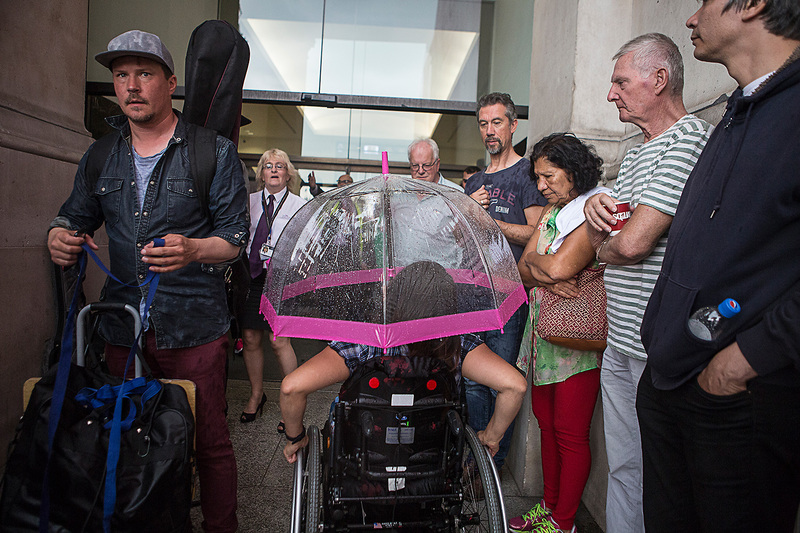 Here, she says, people largely give way to wheelchair users on the street, something she sees as common sense and one way in which her life in England is easier than it would be in China. There were schools nearby, but they were inaccessible to kids like me. All the “able-bodied” orphans went to school during the day, while Chunchun and I spent our days helping the caretakers do chores, or just sitting around in dreary boredom. We helped dress and feed the little children who were too young to take care of themselves. I got around by grabbing my feet with my hands and using my arms to propel me forward in a crouched position so that I hopped like a frog. Because I was slightly more mobile than Chunchun, I also helped with housework, sweeping the orphanage floors, washing bed linens and diapers. But the work didn’t take all day, so we spent most of our time with nothing to do but look at each other. Chunchun sat against the wall with her urine pot, and I would crawl around hoping, wishing something interesting would happen. Sometimes after my chores, I would wander around the orphanage complex and peek into each room to watching the babies playing or seeing what the caretakers were up to. Sometimes I’d talk to the elderly people in the nursing home in the same “welfare complex.” This was how I spent most of my days. A few years before I left the orphanage, we got a T.V. Then I would also watch a lot of cartoons. My favorite show was the popular Journey to the West. I was addicted to that show and to the antics of the Monkey King. I was also allowed more freedom than the other disabled children because the caretakers liked me. They always told me I was smart. They let me ask them about their personal lives. Sometimes they let me skip my chores to play. I was able to do more than Chunchun in those days, but I still thought my life was very boring. The older kids lived together on the upper floor of the orphanage. In one wing were the able-bodied orphans, those who had no physical disabilities. Chunchun and I lived on the other side among kids whose physical disabilities ranged from cleft palates to club feet to epilepsy. We all played with each other, but we also fought a lot. Groups would form alliances and then after a conflict, they would break up and a new group alliance with a new group leader would take shape. It would never last long. This was the way things were throughout my stay in the orphanage. Kids abused each other verbally. They hit and slapped each other. It was stressful remaining in “power” in these groups and trying to fend off conflicts. The caretakers mostly just went about their business, ignoring us unless things got out of hand or we didn’t do our chores. I don’t know how the other kids felt, but I always tried not to get too close to the caretakers. They came and went. And they used corporal punishment on us if we misbehaved. To this day, I still remember how one of the caretakers hit me with a heavy, wooden chair because I had stolen a piece of meat from the cupboard. We resented this kind of treatment, but we couldn’t do anything to stop it. And anyway, I didn’t want to become attached to somebody who was just going to leave me after a while. One day, a group of Americans came to my orphanage, seeking children to be adopted. I had never seen white foreigners before. I thought these people’s physical features were strange. They had yellow hair and big noses. I don’t know why, but I cried when I saw them. Tears streamed down my cheeks. To be honest, I really don’t know why I was crying, I am bewildered myself by my outburst of emotions. It started when one of the foreigners came over to hug me and give me candy. I had always craved that warm, nurturing fatherly love, even if just for a moment. There were times during my stay in the orphanage that I kept hoping that my biological dad had just gotten lost and really did want me back. There had been cases in our orphanage where children had gone astray and their parents simply could not find them. I hoped I was one of them. I wasn’t. Later, after I had moved to America, I found out that the group of Americans who visited were from an adoption agency in Oregon. The director of the agency was a good friend of my adoptive parents, who also live in Oregon. Not long after the adoption agency’s visit, in 1999 or 2000, the director of our orphanage asked me if I would be interested in going to live in America. I did not know where America was and had only vaguely heard of the name from other children and caretakers who sometimes talked about the children “adopted into America.” Despite how little I knew, I didn’t give it a second thought before adamantly expressing my eagerness to go. I was so bored with the dull, routine life in the orphanage, day in and day out, for nearly a decade, that I would have gone anywhere. I lay in bed at night thinking about what my American family would be like. I remember a few months before I was due to leave, I bathed and groomed myself really well because I thought I was leaving for America that day. The caretakers told me I would be leaving in a few months, but I either misunderstood them or the adoption was delayed for bureaucratic reasons. I put on new pink sandals and bright yellow pants from the pile of clothes reserved only for when guests were visiting. I still remember how I eagerly got ready. I took a bath, washed my hair, combed my hair, and dressed myself in the new and colorful clothes. Little did I know, it would be a few more months longer before I would get to leave for my new home. The caretakers told me I was not going to be adopted that day. 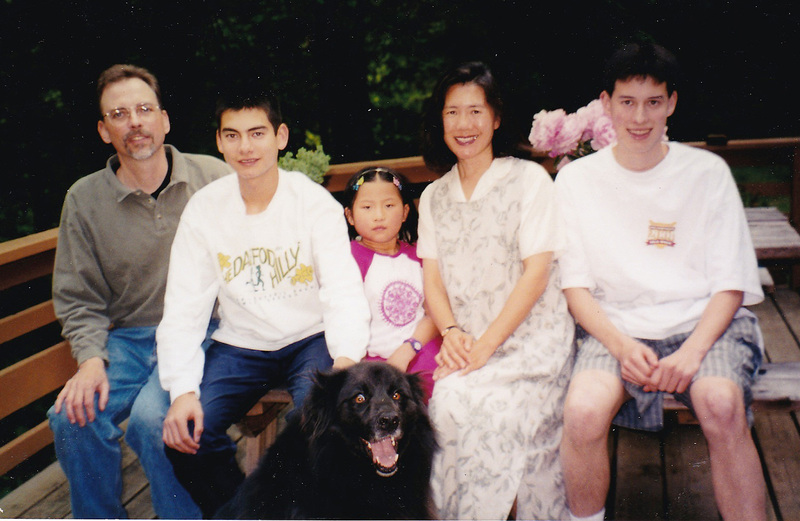 Canaday with her family shortly after arriving in the U.S. in the summer of 2001. My memory of the day I was adopted has blurred over the years. It was 2001. I was bathed and dressed up and driven in a van with a group of babies from the orphanage to meet our adoptive parents in the lobby of a Changsha hotel. My mom says I cried when we first met, but that after she took me up to her room, I quickly recovered and began to play with my new brother and the toys they had brought me. A few days later, we returned to my orphanage to say goodbye. My mother remembers that I was happy to return there, but not sad when it was time to leave. Shortly after I arrived in the United States, doctors diagnosed me with scoliosis and post-polio syndrome. They said if I were not operated on right away, I would not live much beyond the age of 20 due to increasing spinal curvature over time. My adoptive parents immediately arranged for me to have multiple surgeries to straighten my severely bent spine. During my recovery period in the hospital, either my mom or my dad stayed with me every day. They slept in the hospital with me and attended to my every call for water, for food, for candy, for anything that would comfort me. With this excellent care, love, and guidance, I recovered quickly, and rapidly acclimated to American culture. Although I had had no formal education in China, I was placed in the fifth grade. I was nearly 12 years old. Nurturing and supportive parents, and patient, forward-thinking teachers, greatly contributed to my relatively smooth transition to school. I also had private one-on-one sessions with teachers on subjects such as math and reading, and an Individualized Education Plan (IEP) that helped teachers know how best to teach me. But Chunchun did not get adopted into a warm family who loved her and cared about her as much as their own children. She stayed in China, and never got to go to school. If our caretakers’ estimates are correct, today she is 24 or 25 years old. Chunchun is a smart, kind, gentle, and clever woman. 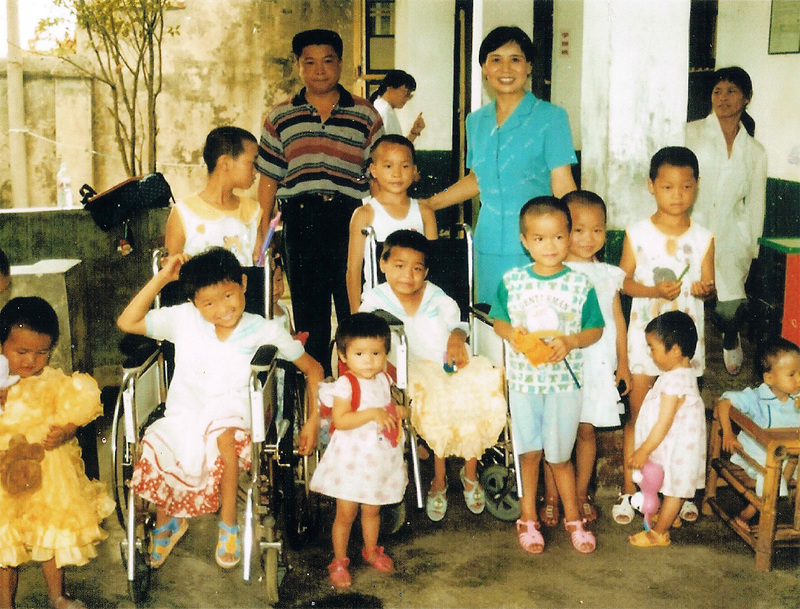 During our time at the orphanage, students would come from various schools to volunteer. Chunchun asked one of them to teach her pinyin, the writing system used to Romanize Chinese characters. As she became more confident in her writing, Chunchun used dictionaries to enhance her vocabulary. She taught herself to write Chinese characters. Chunchun washes her face to get ready for an evening performance in Jiashan. We have kept in touch over the years, talking more and more frequently as we got older. At first, it was once or twice a year from my landline in rural Oregon. My first conversation with her was exciting because we had not talked to each other for so long. She asked me about my life in America, my adoptive parents and brothers, and my schooling. I asked her about changes in the orphanage since I’d left and about our friends who were still there. It was an exciting conversation for the both of us. As technology progressed, we began talking every few months. Now, using apps like QQ and WeChat, we sometimes message each other weekly and, at times, even daily. A few years after I left the orphanage, Chunchun aged out of the children’s welfare complex. When she was around 15 years old, she had to move into the senior living center, where the elderly stayed. Life had been hard for her. Shortly after I left the orphanage for America, Chunchun fell severely ill with a high fever. She was around 10 or 11 years old. She stayed in the hospital for more than a year and a half, but even today, she’s not sure what made her so sick. Doctors nearly left her for dead and said any further treatment would be wasted on her. But one of the caretakers insisted they keep treating her, and she survived. During that year and a half, caretakers from our orphanage took turns going to the hospital to feed and bathe her and to change the cloth diapers she had to wear because of the inaccessibility of hospital bathrooms. In the summer of 2011, I returned to Chenzhou to visit Chunchun. I had a month off from an internship tutoring at an English training center in Guangzhou. It had been nearly a decade since I had left, and after years of wanting to forget where I had come from, now I was curious. Chunchun had moved into a new welfare center, which also combined an orphanage with an old-age home. It was not far from our old orphanage, so we decided to drop by. I felt like I’d stepped back in time. It felt like a lifetime since Chunchun and I had last seen each other. We both had grown up so much and changed in so many ways. But I still remembered her kind eyes, her resilient but frail body, and her perseverant nature. Even though we were not especially close when we were younger, time had made us closer. The bond of our history in the orphanage together had made us feel more connected than ever. At the orphanage, caretakers and other members of the staff who still remembered me were very happy to see me. They were surprised that I had made the trip. In high school, I had raised several hundred dollars to buy Chunchun a wheelchair, and now we explored the city together. On display at the welfare center were Chunchun’s ornate pouches made of yarn and strings of colorful beads. I never could have done anything like them. Her resilience and thirst for life have been a tremendous source of strength for me. She left a few times each year to travel around the streets of various nearby cities, singing folk songs for passersby, earning a meager sum of money. After these trips, she always returned to live in the welfare complex. She arranged this all on her own with other individuals who are disabled. During one of our chats, Chunchun told me that her dream was to own a small convenience store or shop selling handicrafts, and to have her own home. In college, at the University of Oregon, I triple-majored in Asian Studies, Chinese, and International Affairs. I completed a graduate certificate on Disability Studies to prepare me to advocate for the rights of individuals with disabilities. And earlier this year, I completed my coursework for a Master’s degree in the History of International Relations at the London School of Economics and Political Science in the United Kingdom. I expect to graduate in mid-December. Apart from her trips around the country to sing, when she travels with her boyfriend, Lei Yu, who is blind, Chunchun still lives in the welfare center. She has had no formal education because the government does not ensure that schools provide adequate support or accessible infrastructure to students with disabilities. 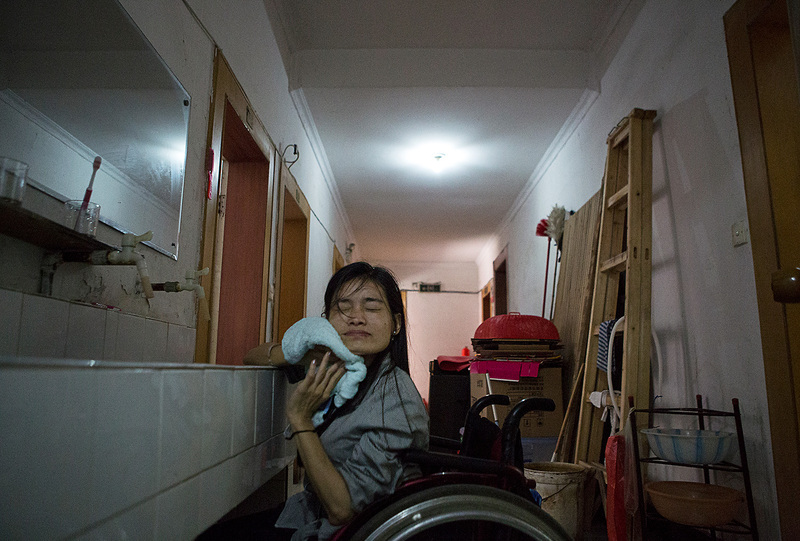 Her experience is similar to the experiences of many children with disabilities in China, who, as Human Rights Watch documented in a 2013 report are more often than not deprived of the services they are owed under Chinese law. 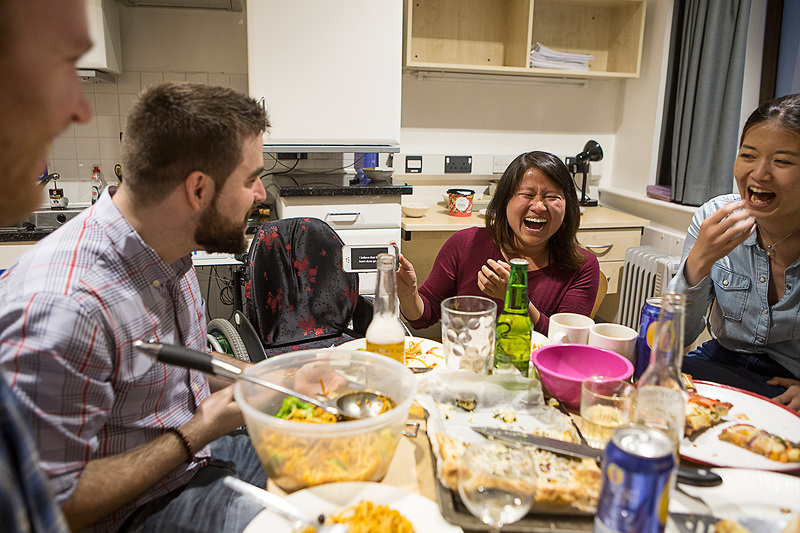 Ming hosts a dinner with friends and classmates to celebrate the end of their semester. People on the street stop to stare as Chunchun and Lei Yu walk with Lei Yu’s children in Chenzhou. What needs to change for those of us with disabilities to live with health and dignity in China? For one, the Chinese government needs to truly commit to inclusive education by drafting a plan with enough funding and training to support schools and teachers to accommodate children with all types of disabilities. This would include children in institutions or orphanages, and ensure they are adequately supported to learn in mainstream schools. China’s Education Department should also provide accessible transportation so that young people with disabilities, like Chunchun, can get to school. And at the policy level, the National People’s Congress needs to revise the Regulations on the Education of People with Disabilities to align with the U.N. Disability Rights Treaty, to which China was a signatory in 2008. These regulations should clearly define “inclusive education” to reflect the principle that children with and without disabilities benefit from learning in the same school environment. In addition, the government can and should run an early intervention program to address health conditions. If Chunchun could have had back surgery at the age of 11, like me, her health might be much better than it is today. These steps may be too late to help Chunchun fulfill her dream, but these changes could make all the difference to the next generation of children living with disabilities in China. About two years ago, Chunchun started complaining of back pain. Her organs were being crushed by her curving spine, and she had a hard time keeping down the food she ate. Knowing how bent her back was, I thought she might need an operation relatively soon. Remembering my own medical history, I searched for an organization that could help Chunchun. Love Without Boundaries took her case and funded X-rays for her back, but the doctor who saw her said that surgery at this stage would be too risky. But earlier this year, when I was in London, I met the founders of the Glow Fund, an organization that provides medical treatment to people in China with serious orthopedic disabilities. Last week, after a 30-hour journey by hard-sleeper train to Yantai, in Shandong province, Chunchun was operated on by a group of orthopedic surgeons from Stanford University, to straighten part of her spine. With luck, it will ease her breathing problems and take the pressure off her organs. This was a lucky break for her, and I’m hopeful her health will improve. But I feel sad knowing that if only Chunchun lived in a society that viewed her with dignity and respect, her life would be so very different.